Word on the internet from a local was it had been raining a lot lately; 12 hours straight on Wednesday alone. We pass through scattered showers as we near Snowshoe Friday afternoon. When we finally arrive we pop some beers and get the tents up as the rain starts. This time it doesn't let up. We hold out hope it will pass like the earlier showers, but it only gets heavier and continues through the night. We bag pre-riding the course, it doesn't seem like it's worth the effort, we'll have enough of that misery tomorrow. Nothing to do but settle in by the campfire and work on some brews. Chad of Team Dad has brought a keg of homebrewed Hefe Weizen. Mmmm, mmmm good. We play this game until the wee hours, hit the hay and wake to a thick fog. Ready to race boys and girls? You better be, you've got some long hours ahead of you. Drink your coffee, warm your bones by the fire and eat some of that home cooked breakfast the support crew has whipped up. They used to ride fixed gear bikes in the Tour, ya know? Can't get to France to see Lance and the rest of the peloton? Want to help earn some easy dollars for MORE? 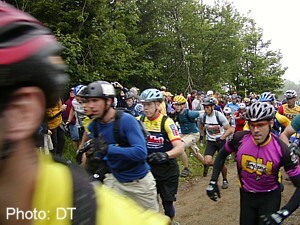 Tour de France viewing parties brought to you by the Outdoor Life Network! Free raffles for great gifts from Trek, Powerbar, Giro and many more! 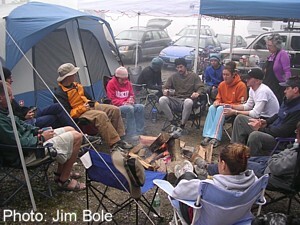 The 2004 24 Hours of Snowshoe is done. Race details will follow when I'm finished unpacking, cleaning the mud out of everything and catching up. 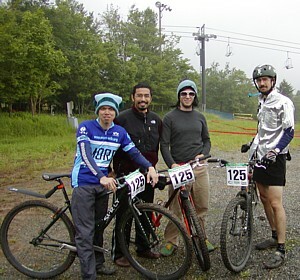 Team Sweet Cheeks managed to reach the podium with a 3rd place finish in the Single/Rigid category. Those interested in the geek-like details of lap times and such can click here for the Granny Gear real-time results. I had no plans to do the race initially, so I've got to thank Ricky, Joe and DT for asking me to join up with them. Extra props go to Ricky for showing up and racing on the tail end of a week-long illness.